Mother's Day is only a little over a week away and I wanted to share with you a terrific gift idea. It's a journal called WHAT I LOVE ABOUT YOU, MOM by Kate Marshall and David Marshall. 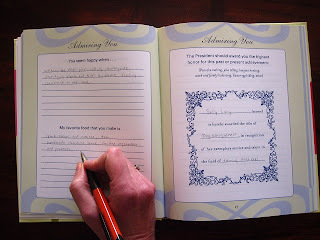 WHAT I LOVE ABOUT YOU, MOM is a fill-in-the-blank journal that allows children to show appreciation for their mothers. I honestly can't imagine a more thoughtful gift! WHAT I LOVE ABOUT YOU, MOM allows children of all ages a way to express their gratitude for how much their mothers have done for them. There are fill-in-the-blank prompts along with checklists and spaces for photos and drawings which make each entry extra-special. There are sections that celebrate Early Days, Admiring You, Appreciating You, Enjoying Us, and My Wishes for You. In addition, there are some extra pages at the back of the journal to make the book even more personal. As a mother, I can't even begin to express how much receiving a keepsake like WHAT I LOVE ABOUT YOU, MOM would mean to me. I know my children love me (and sometimes appreciate me! ), but we aren't the most expressive family. I have a feeling that we're not alone. Life is way too short not to tell our loved ones how much we appreciate them, and WHAT I LOVE ABOUT YOU, MOM makes it easier for individuals to share their gratitude. 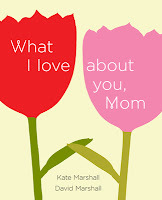 I highly recommend WHAT I LOVE ABOUT YOU, MOM for Mother's Day or any day that you want to let your mother know how much you love and appreciate her! Thanks to the publisher for providing a review copy of this unique book. Wow. That looks like a wonderful gift, especially for creative types. What a great idea for a present! I would even go for one that said, "What I Love About You" (generally)! I think Jill's idea is fantastic. They need to make one not just for mom's but anybody in your life that you love. This is awesome. And no, you are not alone, we are not all that expressive in our house as a rule. Too much teen angst and drama usually.